Improve your board slides and protect your graphic with 2 hard plastic slide rails that mount to the bottom of your deck. Includes 2 rails and 10 wood screws. 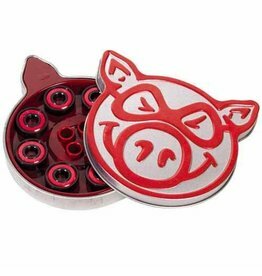 Come in set of 8 bearings with removable red chromium steel dent resistant shields. 7 ball design, grade 10 balls. Silver inner and outer bearing steel. Super finish for a faster spin. The Pig Rails Neon Yellow are made to make life better. Set includes 2 Pig rails and 10 wood screws. Rails are kind of like you've got your baby on board, minus all the gross smells and the whole pregnancy thing. Come in set of 8 bearings with removable neoprene red shields. High speed nylon ball retainer. Heat treated black inner and outer bearing steel.